The CSM training focuses on the perspective of those who use Scrum to get things done. You learn how to be an effective Scrum Master. But also if you are a team member or manager who is involved in Scrum teams, you will learn a lot that will help you. The focus of the training is on structuring and optimizing work in self-organizing teams. And how to become better and better at delivering value for stakeholders. Even in an environment that works less Agile. Various Agile strategies and facilitation techniques are taught and practiced for this. To obtain the CSM certificate, two days of active participation in this course are required. 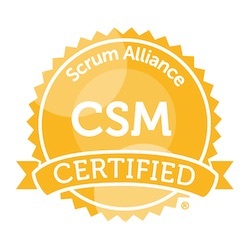 Immediately after the training you will receive an email from the Scrum Alliance to take an online test. You can do this at home or at the office to obtain your certificate.